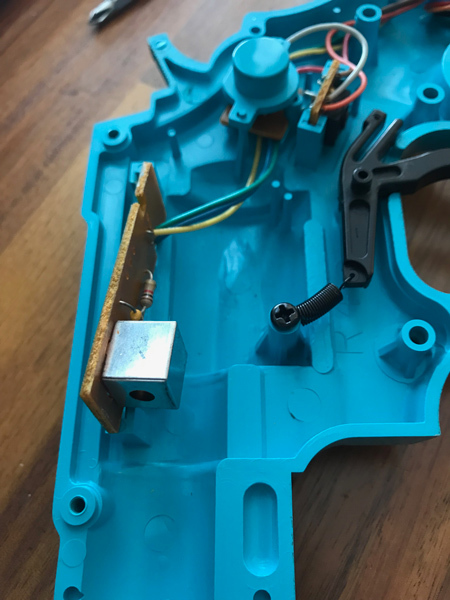 SNES/Genesis Konami Justifier: how to determine photo diode/phototransistor? So I recently bought a Justifier for the SNES port of Lethal Enforcers from crashwg. It doesn’t want to work properly. I didn’t really expect it to given the price I paid. But I’d like to see if I can repair it. Right now, the shooting registers, but the shots seem to be off screen and not accurate. Sometimes I can get it to register on screen. But most of the time it’s not hitting the screen, even when I put the tip of the gun right up to my CRT. I suspect that the phototransistor in it has failed. But there aren’t any markings or pcb labels that indicate what specific diode it is for a replacement. Is there a way I can measure this to determine what replacemdntbpart to get? Or, anyone have or know of the schematics for this part? Re: SNES/Genesis Konami Justifier: how to determine photo diode/phototransistor? Clean the lens and the ends of the sensors dirt can do weird things to light guns! Also tried turning the brightness of the TV up a bit? Yeah, I should have mentioned I tried that already. Brightness up on the crt and in a dim room. Opened up the lightgun and cleaned everything. Still the same result. I’ve read that these diodes don’t last, so I’d like to find a replacement if I can just get the right part number. Afraid I cant help with the Electronics side of things, But there is a Electronics forum (forgot name sorry) where the members are very good at ID'ing parts from pics so they may be able to help. Unfortunately I'll have to remove the metal shielding first, but that's not a big deal with a good de-soldering iron. Dude... remove that shielding. 100% guaranteed that part is marked underneath it. You dont want to turn the brightness up, you want that down. Its the contrast you want to turn up, and more so the blue colour, and this is what the gun will see. Using a CRT projector made it very easy to work out what the gun needs to see and what it does not. • covering blue lens the guns did not function AT ALL no matter how close to the screen you got. Using a direct view set you may need to access service menus to raise blue drive, but usually just raising contrast and lowering brightness is fine. I see it so often people say "turn up the brightness"... Why??? The brightness controls black level or cutoff, which has very little to do with the gun, it sees a white or blue flash, which is a full 100ire, and contrast is the setting that affects that. Right. Regardless, the gun isn't working with whatever the tv is set to. Thanks for the bump, though it doesn't really help answer question on how to determine the photo diode/sensor. Do you know of a way to find this out? I removed the shielding. Didn't see any markings showing what the part is. Doing some googling, I found 3 parts that "look" like they could work as replacements, but I'm not sure by the specs which is best since I don't know how to determine the operational specs of the original one. This one looks the closest, at a 2.7-5.5 VDC , 2 mA draw. Buy 1 of each, start dropping them in, see what happens. Yes i do, but without opening one up i cant tell, because they have no markings, and that makes it hard. Whether or not the comments i made about brightness settings do help you or not, the fact remains it was said brightness should be up, and that is totally incorrect.